That’s a wrap: Ottawa Real Estate Market December 2018! As 2018 wrapped up, the inventory shortage has had a ripple effect; while residential sales were down slightly, it also fueled the condominium market. Overall, 2018 was another stellar year in Ottawa real estate! If you’re thinking of making a move in 2019, we know real estate. We’d love to chat! Year to date activity increased by 2.4 % from 2017. 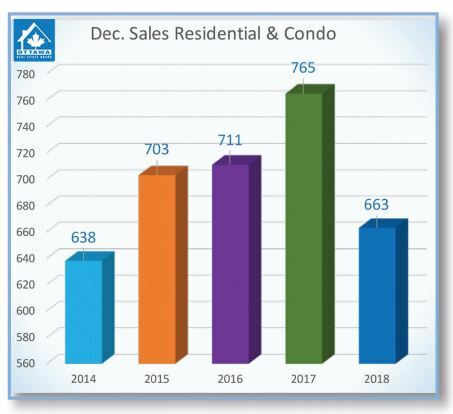 The total number of residential and condo units sold throughout all of 2018 was 17,476, compared with 17,065 in 2017. Residential property class sales decreased slightly to 13,418 from 13,478 in 2017 and condominium property class sales were up 13.1 % with 4,058 units sold in 2018 versus 3,587 in the previous year. Most active Residential price point: $300,000 to $449,999 range accounted for nearly 45 % of December’s sales while almost one in four sales were in the $500,000 to $750,000 price range. Most active Condominium price point: $175,000 to $274,999 accounting for 55.7 % of the units sold. Year-end figures echoed these dominating price points holding 45.6 % of the residential market and 49.8 of the condo market respectively. “For the last decade, we have experienced steady growth in our real estate market from volume to prices; however, the past two years have jumped significantly in activity with a 12.6% increase in unit sales from 2016. Ottawa, and its surrounding area has excellent employment numbers and has proven to be one of the most affordable larger cities in the country,” proclaims Ralph Shaw, Ottawa Real Estate Board’s 2018 President.